Courts 7th Annual OECS Reading Competition | ComeSeeTv Broadcast Network ... Can you See me Now! Courts OECS in collaboration with the Ministry of Education, present to you the 7th Annual OECS Reading Competition live on the ComeSeeTv Network! 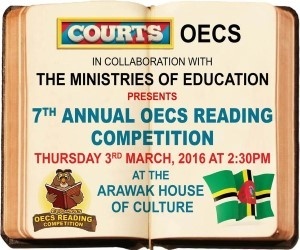 Courts OECS in collaboration with the Ministry of Education, present to you the 7th Annual OECS Reading Competition.